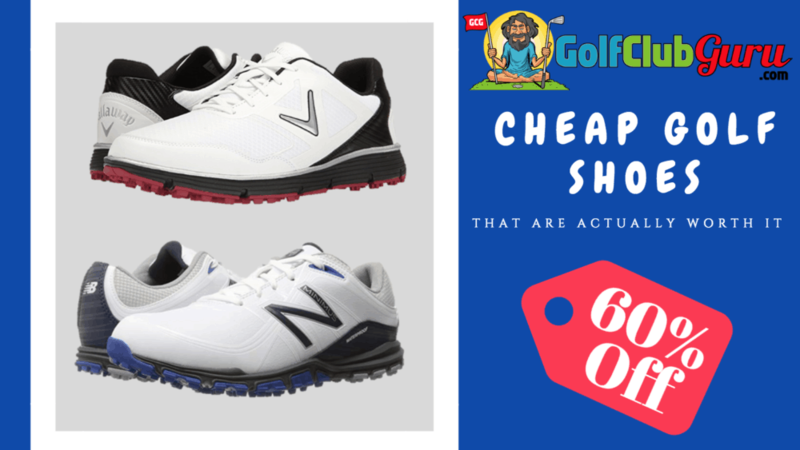 So, you are looking for some cheap golf shoes, huh? Good news is, you’ve got lots of options. Bad news is, you are probably going to need to go to Ross or Marshalls or another discount clothing store to get the BEST deal. If you’d rather pass that up and buy online, I’ll link some of the best value golf shoes that you can buy. If you are looking to spend well under $100, you came to the right article. I’ll go ahead and tell you right now. If you are wanting to buy the cheapest golf shoes that you can buy, you won’t be happy. Almost all of the cheap off-brand golf shoes are made with terrible quality materials and won’t hold up at all. My best advice would be to stick with one of the well-known but still great value shoe brands like Adidas, Callaway, and New Balance. Hell, even Nike has some great budget lines of golf shoes that I’d still consider to be cheap. To be completely honest with you, every good golf brand has at least one good budget style shoe, except FootJoy. However, the companies I listed above give you multiple options of shoes under $75 to pick from. Consider buying used shoes online. There are lots of good, slightly used shoes on eBay that you can buy. Just type in “golf shoes”, put in your size and one size higher, and sort from lowest price to highest price. Try Goodwill: I’ve seen some great golf shoes at Goodwill on multiple occasions. Check out other thrift stores as well. Is it a long shot? Definitely, but you never know. Try Ross, Marshall, etc. They offer some CRAZY deals at some locations. They don’t include the box, but the price is reduced like 60-80% at times, so you have to at least check them out to see. Personally, I’ve never found anything my size there. But I’ve seen a lot of good deals being had on reddit all the time. Callaway Men’s Balboa: These shoes will get the job done. Period. I’ve never owned a pair of these, as I’ve been wearing the same pair of Nike’s for like 3 years now, but the reviews seem to be great. Customers seem to be very pleased with the lightness (don’t weight much) and feel overall, although some complain of poor arch support. For what you pay for them, though, it looks like a steal. I actually really like the design of the shoe. I’ve always been a fan of the combo of white, red, and black. In all honesty I might end up buying these shoes when mine wear out. Today, everyone wears white golf shoes, so you can definitely fit in with that trend with these Balboas. These also come in black, but I can imagine not many customers end up buying them. A grey variety would have been a good option, but what do I know. Adidas Tech Response 4.0: Adidas offers lots of different models of golf shoes under $75, but not many are under that $50 threshold. The best one, in my opinion, that is below $50 is the Response 4.0 model. I really like the white and grey varieties, as they look pretty modern compared to most expensive golf shoes. This model was first released in 2017, and it is one of the most bought golf shoes on eBay and Amazon. Customers seem very pleased with these, except for some that think the toes are a little tight. Considering the average rating and the number that have been purchased though, I’m sure you can’t go wrong. Design-wise, I think they could have done a little better. The fabric looks pretty hard to clean, so if you are a clean freak, you may want to think twice. I always like washing my shoes after a couple of weeks to make them look as new as I can. You can just tell that dirt and mud will get stuck in the perforated materials though, which is why I haven’t bought them. If you don’t mind, though, then it’s still worth it to save the extra money compared to higher end Adidas golf shoes. New Balance NBG1005 Minimus: If you are willing to spend a little more money, literally just $10 more bucks, you’ll get a couple better options. If you have read any of my shoe articles, you know how I feel about New Balance golf shoes. They are extremely underrated! They have been making shoes for decades, and their golf shoes are super comfortable and well designed. Add in the fact that they are nearly all reasonably priced, especially this model, and that’s a combination that is hard to beat. The NBG 10005 Minimus model comes in five different color varieties. The white shoe with a blue and black logo/sole is my favorite one by far. They seem very easy to clean, which is a huge plus for me at least. It looks like a simple rub down with a wet towel will do the trick jsust fine to get these shoes looking nearly brand new. Depending on where you buy them, you might could even find them close to the $50 mark, so look around! Adidas adiPURE Flex: If you are looking for a more traditional looking golf shoes, one that looks very similar to some of the older Footjoy models, then Adidas adiPURE Flex golf shoes will be a good pick for you. You will be sacrificing some comfort, no doubt, but dang do these look solid! I’ve always been a fan of mostly all-white golf shoes, and the three black lines don’t take away from that at all. Overall, a very stylish but professional looking shoe. This is the type of shoes that you see most PGA pros wearing when they play, as opposed to the more comfortable looking types of golf shoes. This model is a good number of years old, hence why the price has steadily dropped over the years. However, a shoe like this, if released this year, would be selling for over $100 easily. Adidas Men’s Adipower Bounce: For an additional $10, you can get a shoe that is a perfect combination of comfort, appearance, and professionalism. The Adidas AdiPower Bounce golf shoe is one of the best value golf shoes you can buy in my opinion. They offer 5 different color combination, 4 of which are primarily white which most golfers wear. It is a very sleek design, and they seem very easy to clean as well due to the one material nearly all the way around. No deep cleaning needed. Reviews have been great on eBay and Amazon. It’s got a wider design than most golf shoes on the market. So if your foot is a little wide, this is a great option. Adidas Men’s 360 Traxion Boa: If you are tired of laced golf shoes, maybe consider buying a pair of BOA golf shoes. Many Boa models sell for over $100, but this adidas pair sells for under $80 if you find the right seller. I’ve always liked the idea of Boa golf shoes. I think we can all admit they make way more sense. My shoes come untied at least once a round, and it’s pretty wild that we all still deal with that everyday. However, Boa shoes just don’t look that great to me personally. If you think otherwise, great! You are more practical than me, that’s for sure. Adidas Women’s W Adizero Sport III: These are the best cheap golf shoes for women. Similar to their cheaper men’s shoes, this model might not be the easiest to clean. I’d definitely try to take care of them as best as possible to avoid having to really put some work into getting them looking like new again. Overall, though, they will last you a very long time and the reviews say that they feel great. If you are not wanting to spend more than $60, it’ll be hard to find many name brand golf shoes that women can buy. For that reason, I’d confidently say that this is the best valued pair of shoes on the market for women at the time of this article writing. Along with every little thing that seems to be building within this subject material, your points of view tend to be rather radical. However, I beg your pardon, but I can not give credence to your whole idea, all be it exhilarating none the less. It appears to everybody that your commentary are actually not entirely justified and in simple fact you are generally your self not really totally convinced of the point. In any case I did enjoy reading it.